Coastliner Way is a long distance walk that approximately follows the route taken by Transdev’s 'Coastliner' bus. One of the main attractions of the walk is that each leg starts and finishes at a Coastliner bus stop. This means that the use private transport is greatly reduced. What makes Coastliner Way different from other long distance trails, perhaps even unique, is that an underlying feature of the walk has been to focus on the regional variations in the landscape as identified by Natural England. Natural England (formerly English Nature) has divided England into 159 distinct natural areas. These are known as National Character Areas (NCAs). Each is defined by its own combination of landscape, biodiversity, geodiversity, history, and cultural and economic activity. The course of Coastliner Way passes through seven of these different Areas. 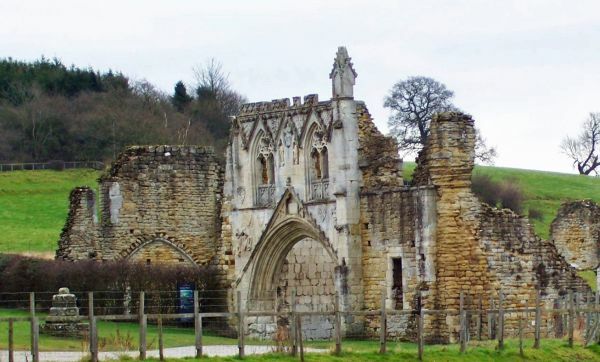 This means that a great variety of Yorkshire scenery and history can be observed. The first 59 miles of the trail run from Leeds to Malton. From there, three separate branches, corresponding to the different routes taken by the 840, 843 and 845 Coastliner buses, lead to Whitby, Scarborough and Filey/Bridlington respectively. Each of the 23 legs of the walk averages about 7 miles in length but short legs can obviously be combined. Total mileages, including the three branches, add up to about 163 miles. 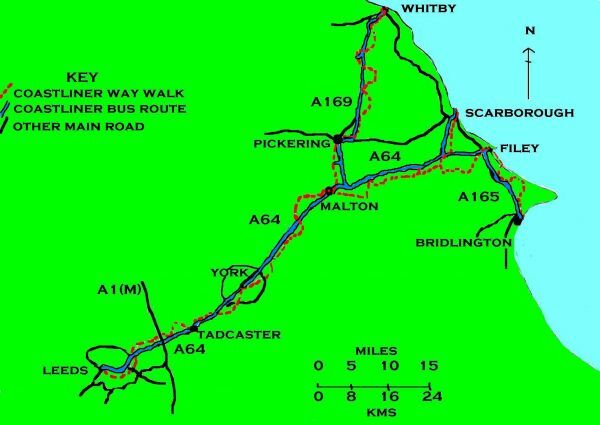 The route from Leeds to Malton covers legs 1 to 8 of Coastliner Way. 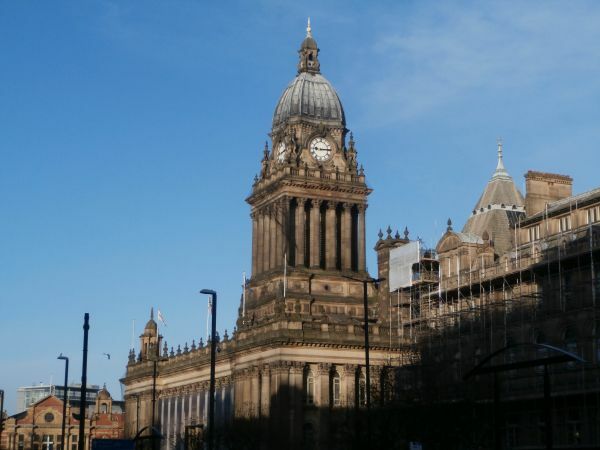 Starting from Leeds Town Hall, the trail passes through Temple Newsam Estate (geologically lying on the rocks of the Yorkshire coalfield) and then through the Magnesian Limestone country of Bramham Park. 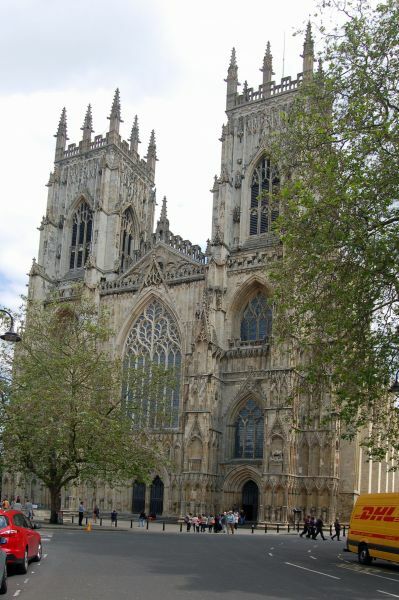 (Magnesian limestone has been used for building York Minster, the Houses of Parliament and Windsor Castle.) From Tadcaster to York the trail follows the Ebor Way before crossing the Vale of York NCA to the River Derwent. Now in the Howardian Hills AONB, the Derwent is followed to Kirkham Priory and from there the route passes through the Castle Howard Estate. The Howardians are a delightful, gently rolling and often under-appreciated landscape. 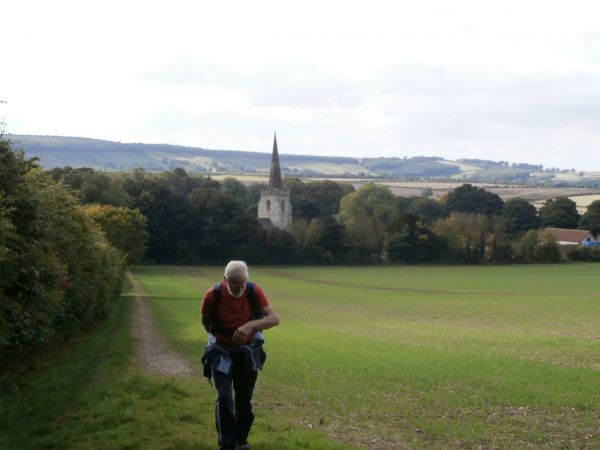 The route from Malton to Scarborough (legs 16 to 20 and covering some 34 miles) uses the Yorkshire Wolds Way National Trail along the edge of the chalk escarpment to reach Flixton. From here it crosses the Vale of Pickering. Although a flat farming landscape, the Vale is archaeologically extremely important and has been described as "the one place in the UK where we can start to understand the continuous sequence of human activity since Old Stone Age times". Coastliner Way passes the key Mesolithic settlement site at Star Carr and over the site of the post-glacial Lake Flixton. With the option of following a short section of the recently established England Coast Path, the walk continues along Scarborough’s seashore, past the spa well that helped to create Britain’s first seaside resort and round the Castle remains perched strategically on Scarborough Headland. Coastliner Way maps and route navigation descriptions are technically free to print out from the website below (www.johneckersley.wordpress.com) although a voluntary donation to Christian Aid is requested. Christian Aid is a Christian organisation that insists that the world can and must be swiftly changed to one where everyone can live a full life, free from poverty. Christian Aid has a vision - an end to poverty - and we believe that vision can become a reality.